At my QTH, I have one dipole that is permanently installed on my terrace. My EDX-2 automatic antenna tuner/coupler is located very close to the feedpoint of this dipole. Sometimes I temporarily put up a second dipole, or other antenna that I want to hook up to the tuner/coupler. It would be nice to be able to do quick "antenna 1 vs. antenna nr.2" comparisons. So I need an antenna switch that is located close to the tuner/coupler. For convenience, I want to be able to control the switch remotely: I don't want to have to go outside every time I want to switch. But I don't want to install wiring from my rig to the switch. Conclusion number 1: I need wireless remote control. For the actual switching, I need relays. How many? Well, let's assume I have two dipoles. If I just want to switch between the two dipoles, two SPDT relays is all that I need. However, with two (crossing) dipoles, I have four dipole legs. I can make six combinations with that! But then I need at least four SPDT relays. Conclusion number 2: I need four SPDT relays. I did not want to spend a lot of time inventing wireless remote control circuitry, so I started looking for an off-he-shelf solution. I settled for a very compact 4-relay card with Bluetooth control. Cost me about US $50 (incl. S&H), early 2015 pricing on eBay. For my situation, Bluetooth gives me enough range: up to 10 mtrs (30 ft). The unit (a TOSR-04) comes with an Android application for Smartphones and tablets with built-in Bluetooth. The relay contacts on this card are rated at 250 VAC / 10 amps. That is similar to the relays in many automatic tuners/couplers (250 VAC / 5 amps in ICOM AH-4, 250 VAC / 15 amps in my EDX-2), and should be adequate. The same supplier also offers this module with WiFi control, but it is more expensive, and does not come with a handy control application. 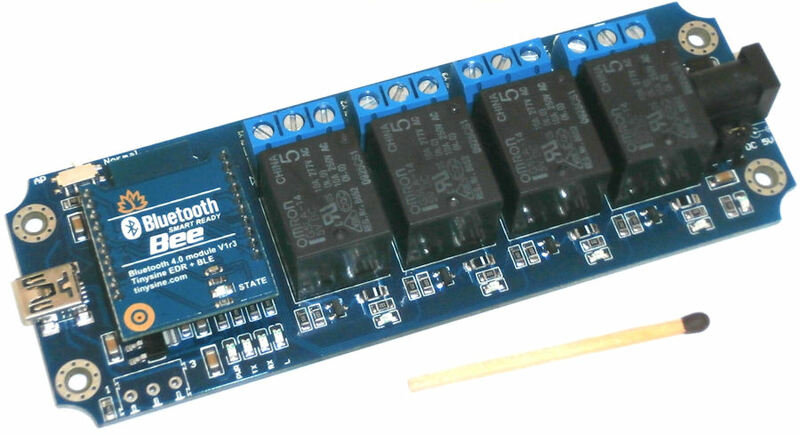 They also offer cards with two or eight relays. The circuit card fits nicely inside a section of 50 mm (2") PVC tubing with end-caps. It does need 5 VDC power. The relay coils draw about 70 mA each. I have a small 12 VDC motor cycle battery, and a simple 5 VDC voltage regulator circuit is all that is needed. In the future, I may try and hook it up the to 12 VDC inside my automatic antenna tuner/coupler. Other than that, four banana jacks (for experimenting with other antennas) is basically all I need!